Fine Grind Himalayan Pink Salt is pure, hand-mined salt found deep inside the pristine Himalayan Mountains. The high mineral content of Himalayan salt crystals contributes to their color, ranging from deep reds to beautiful pinks. 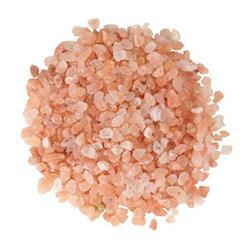 Our fine grind bulk Himalayan pink salt is sized perfectly for direct use in cooking. Try adorning tender white meats such as lean pork, chicken or turkey with the mineral-rich flavor of this gorgeous pink salt. This Jurassic-era sea salt is known for its healing properties and is used by health professionals, spas and individuals who are interested in utilizing natural products to heal the body and relax the mind. The Himalayan pink salt also can be used either during cooking or as a finishing salt.